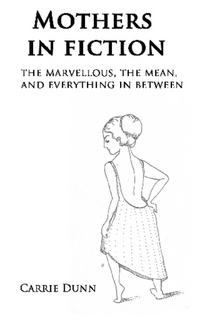 A lovely review for our collection showcasing the marvellous and mean mothers of literature! I’m really thrilled to have been invited to the Oxfam Literature Festival. Come along to the Cotham Oxfam Bookshop on Cotham Hill on Wednesday 11 July at 7.30pm. I’ll be reading from The Light Bulb Moment, Mothers in Fiction and the forthcoming Greta and Boris: a daring rescue. We’ll also be talking about the history of feminist publishing, and discussing. 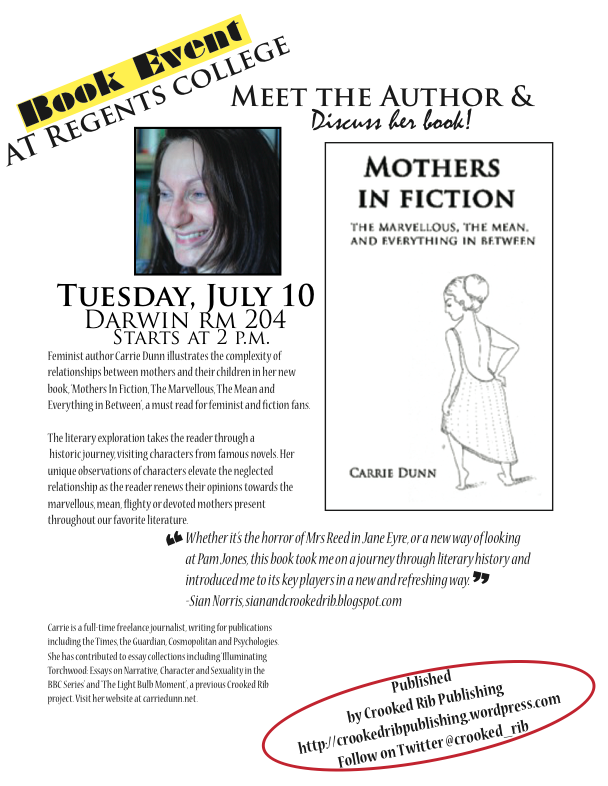 Crooked Rib author Carrie Dunn will be talking about her book, Mothers in Fiction, next week. The talk is happening at Regent’s College in Central London on Tues 10th July, 2pm. We think this paragraph sums up the book’s purpose beautifully! Renowned feminist writer Carrie Dunn’s collections of literary sketches of the relationships between mothers and their offspring is a must read for fans of fiction and feminism, and for anyone who is, or has, a mother. Dunn takes the reader on a journey through literary history, visiting Mrs Capulet, Mrs Bennett, Sue Bridehead and Mammy Walsh along the way. Her well-observed portraits bring to life this often-neglected relationship, as we rethink our attitudes to the marvellous, the mean, the flighty and devoted mothers that populate our favourite books. Dunn notes that throughout history, mothers have been silenced or ignored by literary criticism, or else their motivations and actions have been dismissed as trivial. Her book aims for us to take a second look at the role motherhood has played in literature, and demands that we re-evaluate and question our often negative reactions to mother characters – from Mrs Bennett’s superficiality to Mrs Capulet’s abandonment of Juliet. She examines how sexism or male bias in literary history has led to condemnation of mothers in fiction whilst failing to recognise or evaluate the social and cultural norms of the period that influenced or shaped these characters. Do we judge and ignore literary fathers in the same way? The portraits Dunn paints in her book are very funny, very knowing and sharp. The 20 short sketches take us on a literary journey of 500 years of literature’s mums. This book is for anyone who is, or has, a mother, and for anyone who loves great reads. What inspires women and men to become feminists? Bristol-based writer and activist Sian Norris’ new book, The Light Bulb Moment, seeks to answer this question. Contributors share their funny, moving and inspiring stories. After the speakers share their stories there will be a panel discussion on the future of feminism. Speakers include Natasha Walter (Women for Refugee Women); Zohra Moosa (Actionaid); Chitra Nagarajan (Southall Black Sisters); Anna van Heesvijk (Object), and Mara Clarke (Abortion Support Network). Fantastic feminist writer (and contributor to The Light Bulb Moment) Carrie Dunn has submitted her latest manuscript to us to publish. The book is called ‘Mothers in Fiction’ and well, it does exactly what it says on the tin. It is a collection of thoughts and essays on the role of mothers in fiction, the marvellous, the mean and everything in between. We meet Mrs Dashwood, Marmee March, Scarlett O’Hara, Mrs Simon, Katherine Krupnik and many more, as Carrie takes us on a journey through the history of fiction and the mothers that populate their pages. We’ve pencilled in a launch in time for our book event on 15th May so watch this space.